All Products > "5500007 Seagull N.A. P-51 Mustang (SEA-276)"
Very few R/C warbirds fly as well as the Mustang, indeed this terrific 56� span version for 5 / 6 function radio only goes to prove the point. 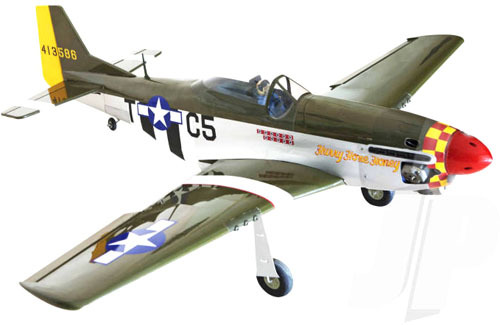 Built from lightweight CNC-cut balsa and ply, wrapped in matt Oracover and displaying the colour scheme of US Army Air Force P-51D �Hurry Home Honey�, it�s the perfect choice for your .60 two-stroke, .70 four-stroke, or electric equivalent powerset. Perfect for popping in the car in one piece this gem of a model is an everyday warbird with the look and performance of something twice its size. Supplied with a fixed undercarriage as standard, the recommended conversion to electric retracts is both convenient and easy, with mounting blocks, wheel wells and leg covers either pre-installed or supplied for retro-fit. • Lightweight, CNC-cut balsa and ply construction. • Evocative scale colour scheme. • Covered in genuine matt finish Oracover film. • Factory painted fibreglass engine cowl. • Detailed cockpit with lightweight painted pilot figure. • Forward fuselage hatch for easy tank and flight battery access. • Full hardware pack included for either glow or electric power. • Includes parts for fitting optional retracts (available separately).